PDS Organic spices has always been extremely focused at pioneering new products that address key applications from time to time. Our Quality assurance Lab initiatives are driven by an able team of technicians, backed by facilities that are at par with the best in the world. Our Quality assurance Lab initiatives are directed towards value added products and process innovation. 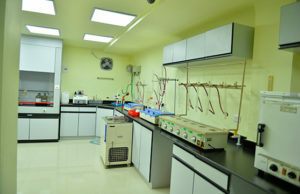 Our Quality assurance Lab consists of state of the art laboratories, instrumentation, bench and pilot scale plants etc that enable our technicians to spearhead research activities on several natural bio-active ingredients, isolating and standardizing these active principles from nature. USDA ORGANIC approved packaging conforming to international quality specifications is used for all products. PDS Organic spices maintain a substantial stock of regular products. This enables it to supply ample quantities, as and when they are demanded. It is this committed effort that has brought PDS Organic Spices to the forefront of the Organic spice industry. We are a company at the edge of technology and this means following the finest practices in quality management. We have a multi-layered quality control system that begins right at the farming stage. This ensures that the raw materials that from farms are of utmost purity and meets our stringent quality norms. These units are ISO 22000:2005 and BRC AA certified, and they assure our customers a globally recognized quality-control system. It is our technological superiority, our expertise of over three decades, and our long-trusted tradition of impeccable product quality that makes us the preferred partner to some of the biggest global businesses today.